Using fabric scraps, paper, string and “oops” paint, Emily Little of Little E Studio creates paintings that are full of color, texture and layers. Emily always enjoyed being creative but, until recently, dabbled more in crafts than in art. Refurbishing thrift store and garage sale finds with paint and fabric for an antique booth provided a natural transition into her current style of painting. Prior to becoming an artist, Emily was an English major with her nose in a book who tutored children with learning differences for thirteen years. Needing a creative outlet after closing her antique booth, Emily took a weekend abstract art class that utilized found objects and house paint and emphasized expression over perfection. With a garage already stocked with gallons of leftover paint and fabric from craft projects and redoing furniture, Emily began painting every day. Other than that weekend class, Emily is primarily self-taught. Her style developed as she experimented with different mediums and applications until she found her niche with acrylic paints and the palette knife. Emily’s original work can be found in galleries, shows and stores in the Nashville, TN area and at The Blue Giraffe in Watercolor, FL. 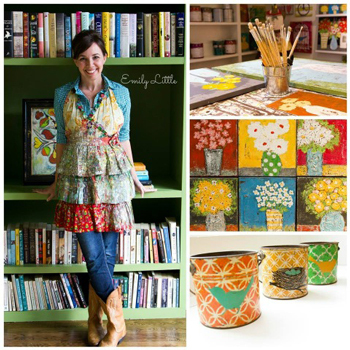 Her Little E Studio licensed products from Creative Co-op can be found in boutiques nationwide. Emily lives in Nashville, Tennessee, with her patient husband, darling daughter, and very needy rescue dog.